It’s important to me that everyone feels safe and comfortable in the spaces they take up on campus. 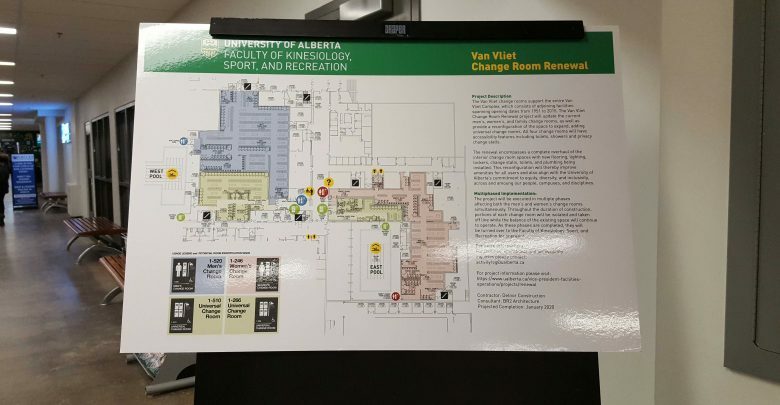 The University of Alberta in providing more of those spaces. The Van Vliet change rooms. Old, rusty and falling apart, the university has finally put in place $6 million for renovations of lockers, lighting, plumbing, flooring and change stalls in the change rooms. Expected to be finished by January 2020, the biggest alteration students should keep an eye out for is the creation of two new gender-neutral change rooms. These rooms will provide more privacy for students with the incorporation of things like closed-off shower stalls. On occasion, in the past, if people required a gender-neutral change space, they would have to ask a staff member to provide that space for them, which can sometimes be a little awkward for the person asking and the people who work there. Therefore, to avoid this, as well as help the people who require a separate change room feel safe and accepted on campus, it only makes sense that the university is making these changes. Additionally, these spaces can help prevent cases of potential discrimination against transgender and non-binary people. In May 2018, Christynne Wood, a transgender woman from California, faced verbal assault from a male gym member in the male change room. While she was later moved to the upstairs male change room, she continued to face discrimination from other gym members. Gender-neutral changing spaces can help people like Christynne, although they might not be able to prevent cases of wider discrimination. The renovations, though, are a step forward in improving safer facility accessibility for transgender and non-binary people. As a Muslim, I believe it’s important that all individuals feel comfortable doing what it is that they want to do, going wherever it is that they want to go, and using whatever facility it is that they feel they should use. I come from a group of people whose identity is criticized, judged, misunderstood, and often rejected by the general public. Having to explain myself to people can often become hard and frustrating. For that reason, I understand the importance of these renovations for those who require it. For me, I require safe space to pray five times a day where I won’t be judged or criticized. The university has created a multi-faith prayer space for me where I can safely perform my five daily prayers. I believe if the university accommodates for one group of people, others should also have the space they require where they’re free from judgement. Everyone should have the freedom and choice to do whatever they want to do. The criteria here is to respect people’s decisions and expect the same respect back. I believe that if the change rooms are going to make day-to-day living easier for transgender and non-binary people, then it’s important we have them. Although systemic discrimination cannot be resolved with the creation of gender-neutral change rooms, it’s still important to recognize that the university is at least attempting to provide safer and hopefully more accommodating spaces for transgender and non-binary people.